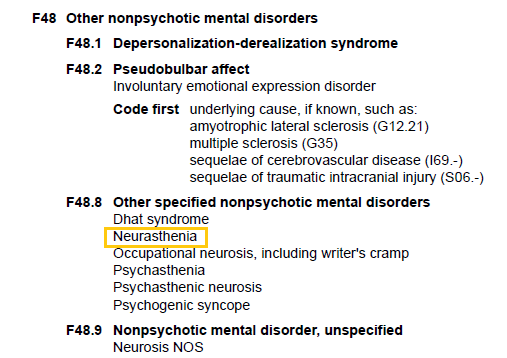 When ICD-10 was completed in 1992, Chapter V Mental and behavioural disorders retained the disorder category term, Neurasthenia, coded at F48.0. F48.0 Neurasthenia (with Fatigue syndrome as inclusion term). The forthcoming U.S. specific ICD-10-CM inherits Neurasthenia in Chapter 5 Mental, Behavioral and Neurodevelopmental disorders (F01–F99). But here, it is coded under F48.8, owing to the different coding arrangement for the F48–F48.9 entities within ICD-10-CM. *Although the FY 2015 ICD-10-CM is now available for public download and viewing, the codes in ICD-10-CM are not currently valid for any purpose or use until implementation date is reached. There was no discrete category for Neurasthenia within DSM-IV or DSM-IV-TR; nor within DSM-5, which published in May 2013. I reported in 2012 that for ICD-11 and ICD-11-PHC, the intention is not to retain Neurasthenia. On Page 563 of this review paper, the authors state that a major highlight of the proposals of the ICD-11 Expert Working Group on Somatic Distress and Dissociative Disorders (the S3DWG sub working group) for the revision of the ICD-10 Somatoform disorders is that of subsuming all of the ICD-10 categories of F45.0–F45.9 and F48.0 under a single category with the proposed name of “Bodily distress disorder” (BDD). ICD-10 PHC is a simplified version of the WHO’s ICD-10 chapter for mental and behavioural disorders for use in general practice and primary health care settings. 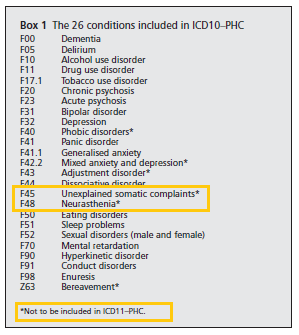 This system has rough but not exact equivalence to selected of the mental disorders in the core ICD-10 classification. The ICD-10 PHC includes and describes 26 disorders commonly encountered within primary care and and low resource settings, as opposed to circa 450 classified within Chapter V of ICD-10. For ICD-11 PHC it is also the intention not to retain the category F48 Neurasthenia. Goldberg DP. Comparison between ICD and DSM diagnostic systems for mental disorders. In: Sorel E, ed. 21st Century Global Mental Health. Jones & Bartlett Learning, 2012:37-53. This list of disorder proposals and groupings may have undergone further revision since publication of 21st Century Global Mental Health. But no progress reports have emerged on behalf of the Primary Care Consultation Group (PCCG) setting out more recent proposals for their “Bodily stress syndrome” construct since the Lam et al (July 2012) paper . The disorder term and construct that is entered into the ICD-11 Beta draft and defined with three severities, is the S3DWG group’s conceptually different, but similarly named construct, Bodily distress disorder (BDD). The ICD-11 S3DWG group is advising ICD Revision in parallel with the PCCG on a potential replacement for the ICD-10 Somatoform disorders. 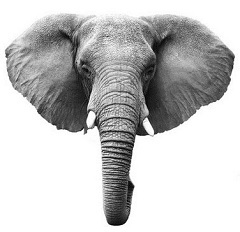 It is the case, however, that some professional and consumer stakeholders are unaware that are two groups advising on the revision of the Somatoform disorders, that there have been two sets of proposals presented, or how they differ in conceptualization. Four revised definition texts were submitted to the Proposals List on behalf of Mental Health TAG for “Bodily distress disorder (BDD)” on January 9–11, which will be the subject of a future post. However, a couple of redundant listings for Neurasthenia as an exclusion term remained in the Beta draft as legacy text from ICD-10, under Exclusions to Fatigue (Symptoms and signs chapter) and Generalized anxiety disorder (Mental and behavioural disorders chapter). The deletion of Neurasthenia as an exclusion term to Fatigue has now been attended to. Neurasthenia is not recommended for retention as a disorder category in ICD-11. Therefore, this exclusion term is not longer necessary. If the concept is not retained in ICD-11, then the concept would be marked as obsolete rather than deleted. Thank you!